Refrigerate or freeze perishables right away. Foods that require refrigeration should be put in the refrigerator as soon as you get them home. Stick to the “two-hour rule” for leaving items needing refrigeration out at room temperature. Never allow meat, poultry, seafood, eggs, or produce or other foods that require refrigeration to sit at room temperature for more than two hours—one hour if the air temperature is above 90° F. This also applies to items such as leftovers, “doggie bags,” and take-out foods. 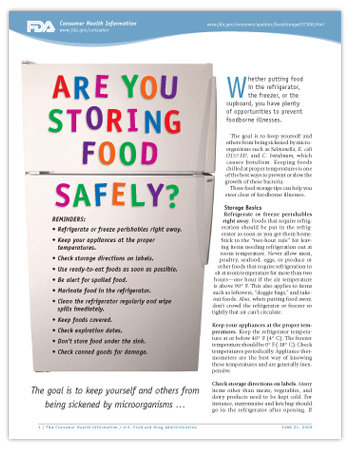 Also, when putting food away, don’t crowd the refrigerator or freezer so tightly that air can’t circulate. Keep your appliances at the proper temperatures. Keep the refrigerator temperature at or below 40° F (4° C). The freezer temperature should be 0° F (-18° C). Check temperatures periodically. Appliance thermometers are the best way of knowing these temperatures and are generally inexpensive. Check storage directions on labels. Many items other than meats, vegetables, and dairy products need to be kept cold. For instance, mayonnaise and ketchup should go in the refrigerator after opening. If you’ve neglected to properly refrigerate something, it’s usually best to throw it out. Use ready-to-eat foods as soon as possible. Refrigerated ready-to-eat foods such as luncheon meats should be used as soon as possible. The longer they’re stored in the refrigerator, the more chance Listeria, a bacterium that causes foodborne illness, can grow, especially if the refrigerator temperature is above 40° F (4° C). Be alert for spoiled food. Anything that looks or smells suspicious should be thrown out. Mold is a sign of spoilage. It can grow even under refrigeration. Mold is not a major health threat, but it can make food unappetizing. The safest practice is to discard food that is moldy. Marinate food in the refrigerator. Bacteria can multiply rapidly in foods left to marinate at room temperature. Also, never reuse marinating liquid as a sauce unless you bring it to a rapid boil first. Clean the refrigerator regularly and wipe spills immediately. This helps reduce the growth of Listeria bacteria and prevents drips from thawing meat that can allow bacteria from one food to spread to another. Clean the fridge out frequently. Keep foods covered. Store refrigerated foods in covered containers or sealed storage bags, and check leftovers daily for spoilage. Store eggs in their carton in the refrigerator itself rather than on the door, where the temperature is warmer. Check expiration dates. If food is past its “use by” date, discard it. If you’re not sure or if the food looks questionable, throw it out.